Marine Drive depicted in red. Canal District depicted in blue. 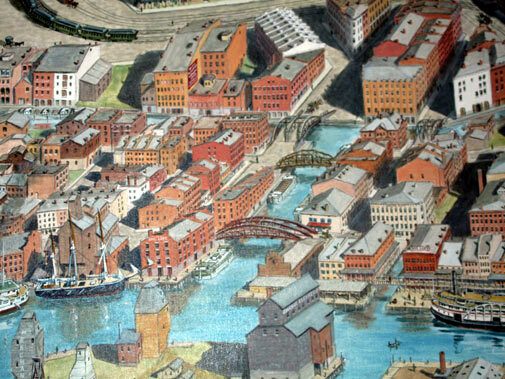 This post is the third and final park in a series on the history of Buffalo’s Canal District. 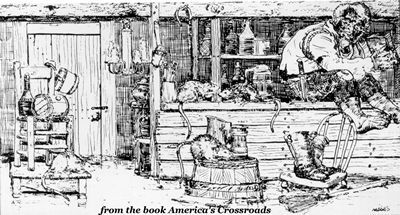 Click here to read Part One, about the early days of the Canal – the Canal Street era. 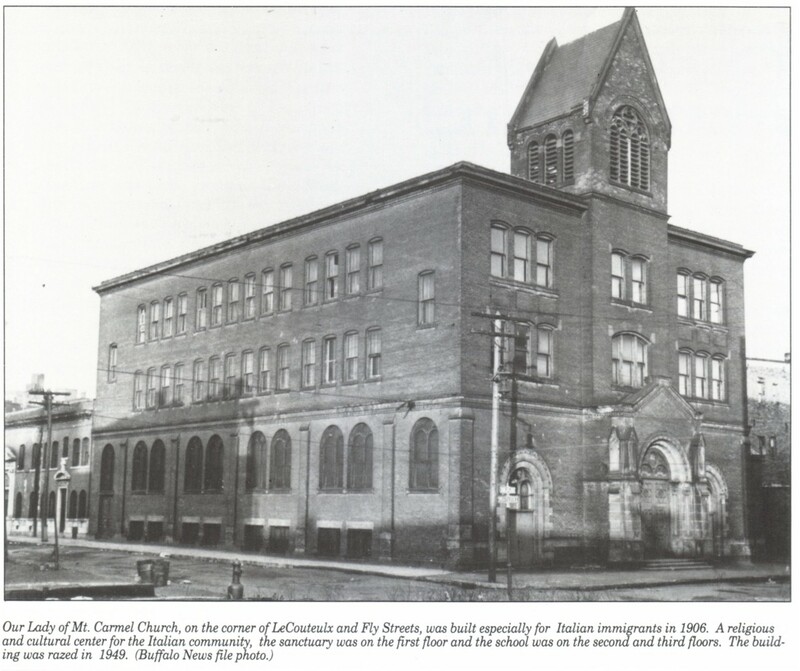 Click here to read Part Two – the Dante Place era. 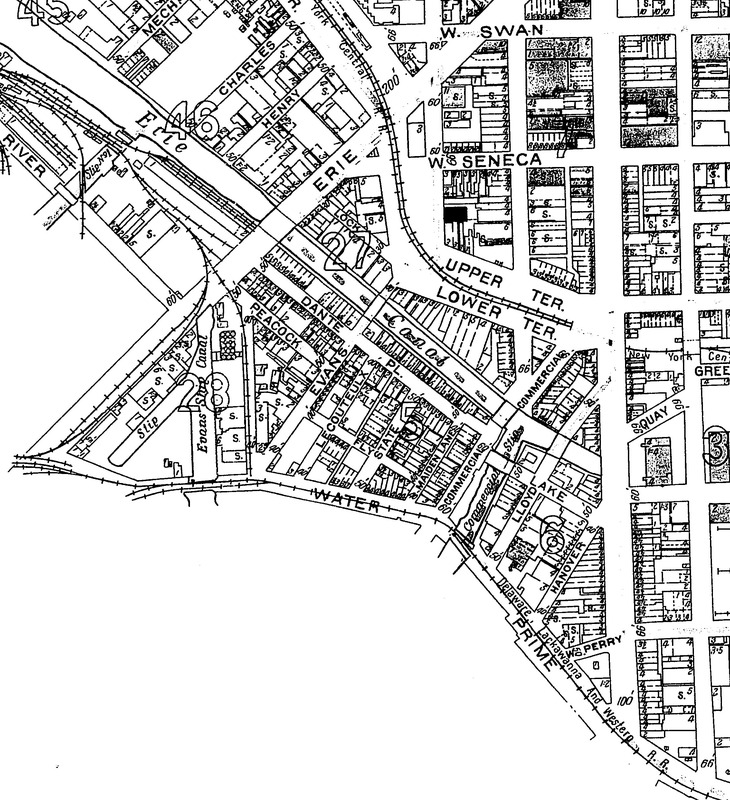 Today’s post is about the Marine Drive era of the Canal District. Marine Drive replaced Dante Place during the 1950s. Marine Drive stretches from Main Street to Erie Street and forms a loop, intersecting upon itself after circling around the Marine Drive Apartments. If you zoom in far enough on online maps, you’ll see that a small part of Marine Drive still holds its claim as “Dante Place”, at least according to google! A little sliver of Dante Place (top center part of the picture) still shows up in Google! Plans were developed to build “Fairhaven Village”, a private development for 1,078 middle-income families. 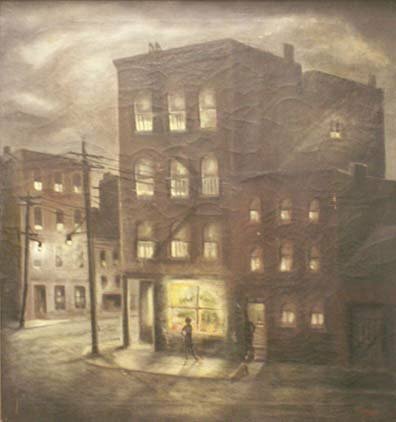 After a building explosion in 1936 and the 1936 State Law allows cities the right to condemn and remove “unsafe and unsanitary” buildings, buildings began to be demolished. Approximately 500 families moved out of the neighborhood in the summer of 1937. It was to be one of the first slum clearance rehabilitation projects in the Country. Early plans for Fairhaven Village in 1938 called for accommodations for 962 families with a total of 2,942 rooms. The apartments were to include a 500 car garage to be built below grade of the apartments. The apartments were to average $17.50 a room, including hot and cold water, gas, electricity and refrigeration. It was going to be the first project of its kind to be privately owned, managed and financed. At the time, there was a rental shortage in Buffalo, and reports estimated that there were close to 7,000 families living doubled (or tripled) up in apartments meant for one family. However, the effects of the Great Depression and later wartime restrictions limited the construction funds to build the development. 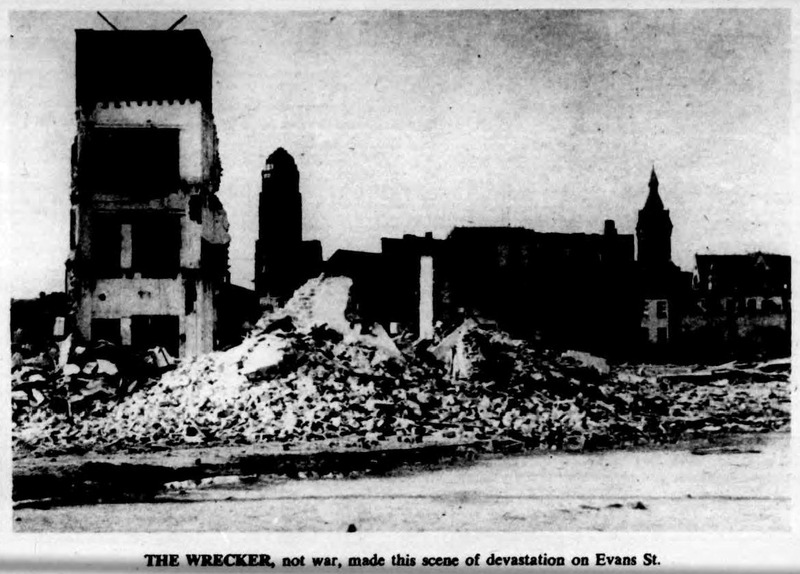 Evans Street Demolition 1950s. Note City Hall in the rear background of the photo. After WWII, the Buffalo Municipal Housing Authority began plans for low-income housing in the Dante Place district, despite local opposition. In 1948, 90 families were displaced by the State for construction of new housing, which began in 1950. The Dante Place Projects were completed in 1952, residents moved in during September of that year. 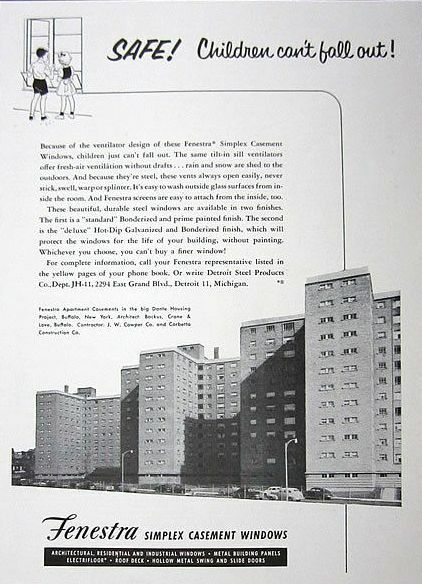 The seven 12-story buildings were the first permanent state-aided housing in the City of Buffalo and consisted of 616 units. Each building contains a mix of one, two, three, and four bedroom apartments. When the Dante Place Project was in its planning stages, Howard Kelly of the Municipal Housing Authority stated: “We hope that this will be the first step of a waterfront beautification program which will continue right through to Porter Ave”. 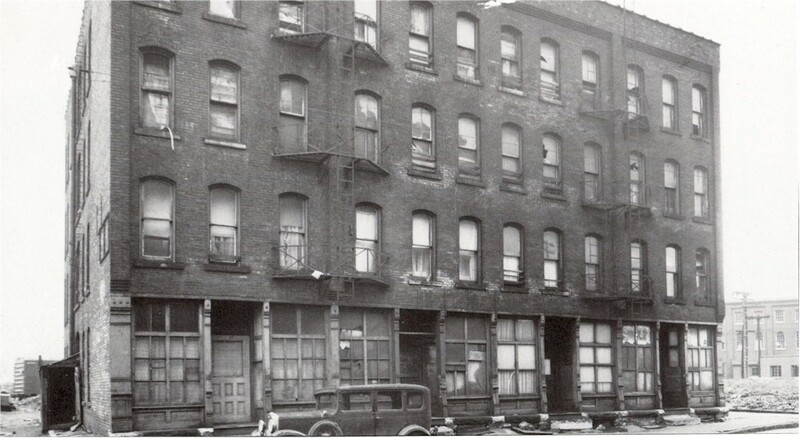 By 1960, many of the tenants of Dante Place Project were those displaced from condemned substandard housing on a the Lower East Side of Buffalo, a historically black section of the City. The Dante Place projects had become again considered to be a slum area. The BMHA was losing money due to unfilled apartments. 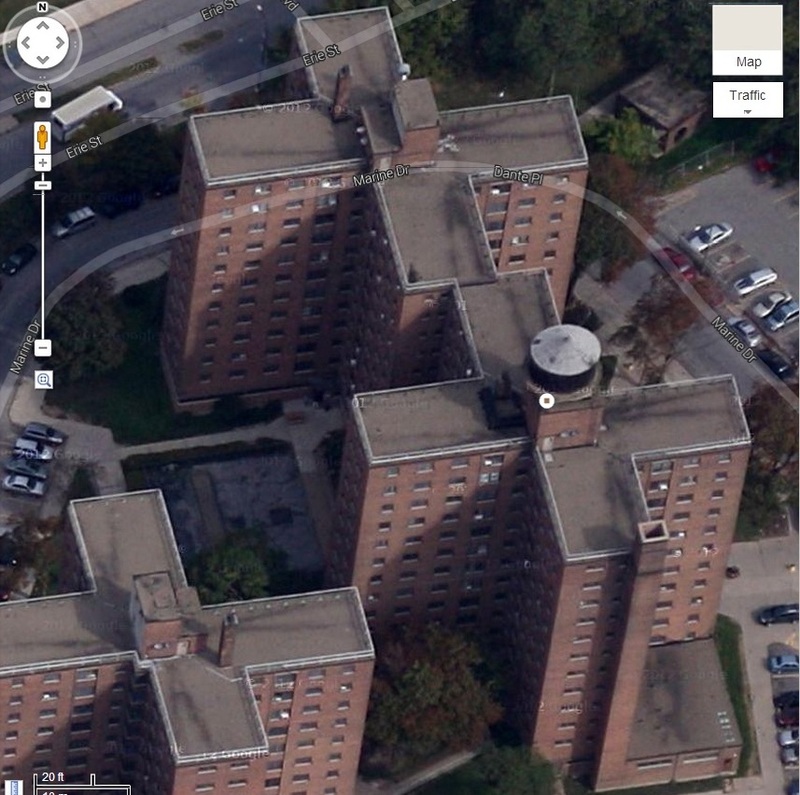 The BMHA responded by moving low-rent residents back to the Douglass Towers and the Ellicott and Talbert Mall. This was the first attempt in the country to convert public low-cost housing into privately owned development. The tenants formed the Dante Tenants Defense League to represent the 400 families remaining in the project and fight the evictions. In 1960, the group went to the state housing commissioner, but they were unsuccessful fighting the conversion of the complex. New York State Supreme Court Judge Catalano ruled in October 1960 that the conversion was not in violation of New York Public Housing Law. By 1961, Dante Place resembled what had been originally been proposed as the Fairhaven Village – converting the complex from public housing to subsidized moderate income rental apartments. A $300,000 remodel was completed and the apartments were rented out. This project was the first time in the United States that a low-income housing project was converted into a private non-profit middle-income apartment development. Once the new complex reached 92% occupancy, the tenant stockholders elected a board of directors and officers to manage the development. The complex was renamed Marine Drive Apartments. When planning for the Dante Place Projects, there was a great discussion among the City Planning Board members regarding what to name the new street. Councilman John Ramunno argued for the new street to be named “Dante Place” to keep with the history of the neighborhood. 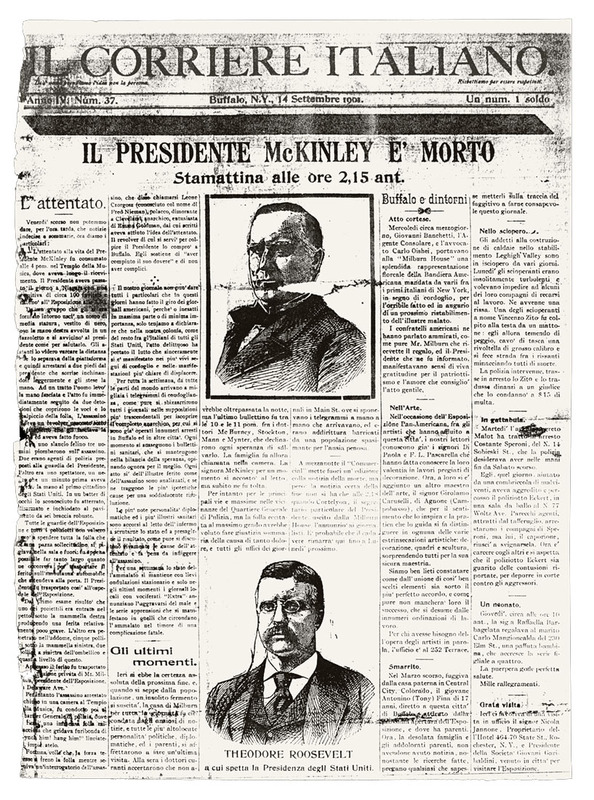 However, the Council President and others protested because they wanted a new name that did not have a connection to the past, the history of the neighborhood, or the Italian culture that it represented. The Council eventually voted in favor of removing ties to the “old environment” and Marine Drive was named due to the waterfront neighborhood’s location. 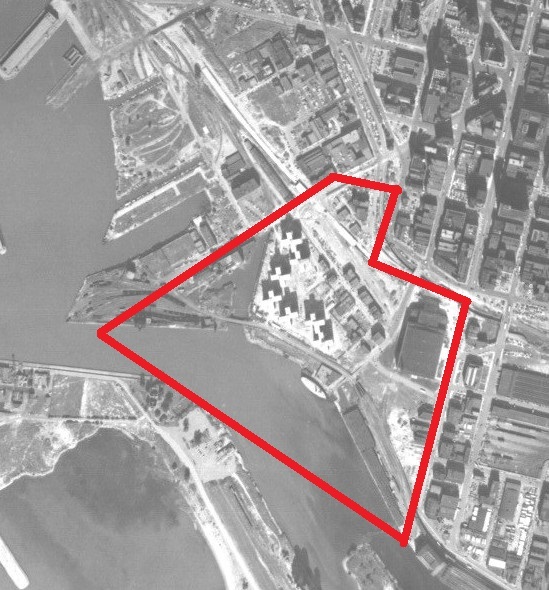 As part of the Downtown Urban Renewal Plan, development of the Waterfront Village began. The first condos opened in Waterfront Village in Summer 1972. In 1974, the Erie Basin Marina was completed, built by slag from Bethlehem Steel. The gardens at the Marina were developed by Stanley Swisher, supervisor of the grounds for the City’s Engineering Department. Stanley Swisher would plant a new bed of perennials each year. 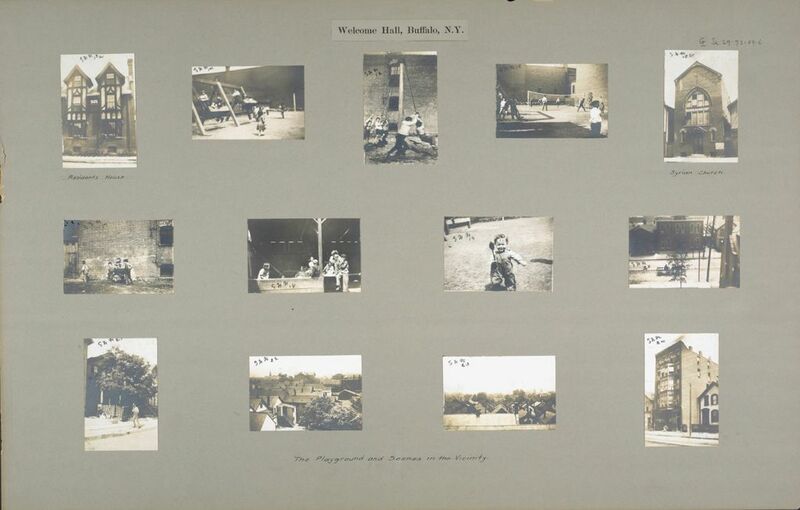 In 1979, the Buffalo Naval and Servicemen’s Park opened. The original display included the USS Little Rock and the USS The Sullivans. In 1988, the submarine the USS Croaker was added to the display. Other than the Marine Drive Apartments and Waterfront Village, since the 1950s, much of the Canal District sat vacant and silent. The Central Wharf and the Commercial Slip were buried and covered in stone and parking areas. In 1999, as part of Phase I of the Erie Canal Harbor plan, the Naval Park moved as part of a $15.5 million dollar improvements to the Erie Canal Harbor. Memorials were moved to the newly created Veteran’s Park. The USS Little Rock, the Sullivans and the Croaker were repaired and moved to the new Naval Basin. The existing esplanade facilities were enhanced and expanded to create a continuous walkway along the edge of the water. The Erie Canal Harbor Development Corporation was created in 2005 to help restore economic growth to Buffalo and WNY’s waterfront. 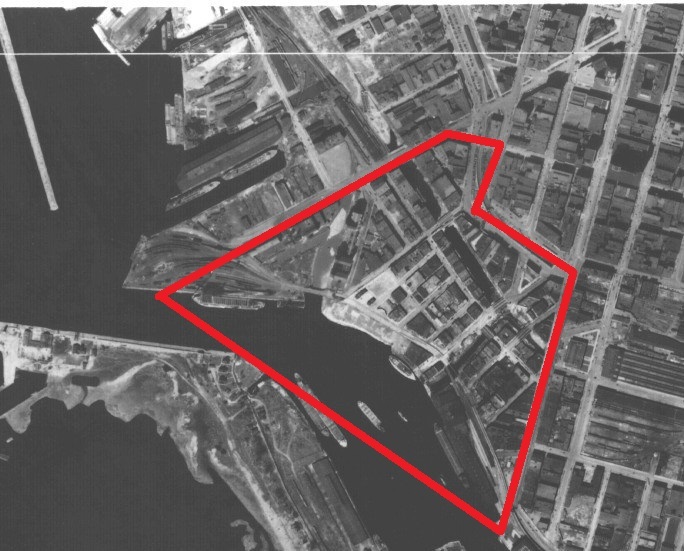 Phase II of the Erie Canal Harbor plan was completed in 2008 and included the re-watering of the Commercial Slip, a towpath/walkway on the edges of the slip, construction of a bowstring truss bridge, the reconstruction of Commercial Street, Lloyd Street, Perry Street and Hanover Street, and the uncovering and preservation of the Steamboat Hotel and Lloyd street as an archeological site. A wooden wharf was created, along with floating docks. 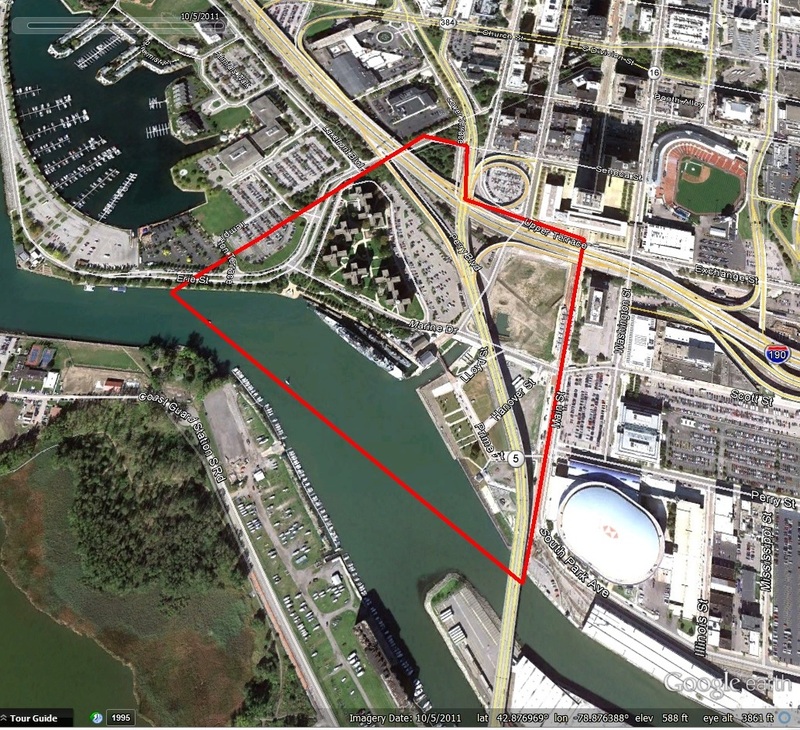 This area is referred to as Canalside, a 20-acre part of the historic Canal District. Canalside has been successful in drawing people down to the waterfront – offering programming, events, festivals and other attractions. 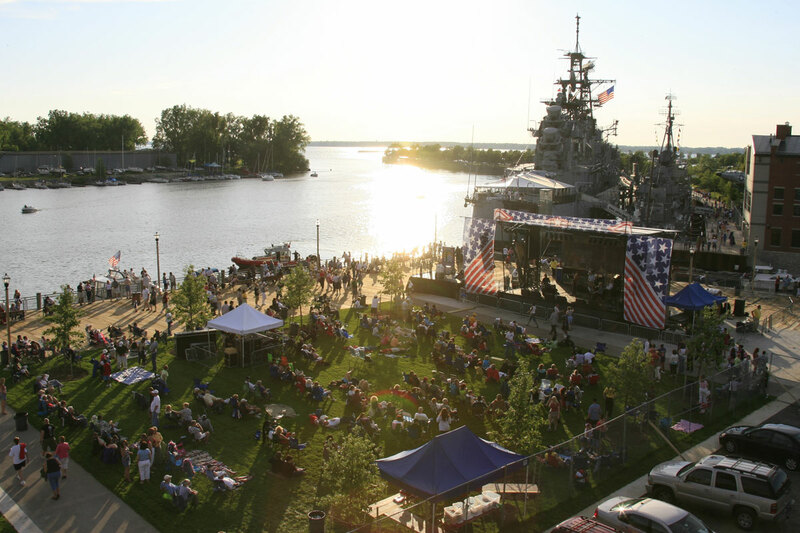 Canalside has more than 750 events and 750,000 visitors annually. Memorial Auditorium closed in 1996, when the Buffalo Sabres, Blizzards and Bandits moved across the street to the newly built Crossroads Arena (now First Niagara Center…click here to learn more about the name of the Arena). Plans to renovate and repurpose the Aud were shuffled around for years, including the reuse of the Aud as a Bass Pro site. 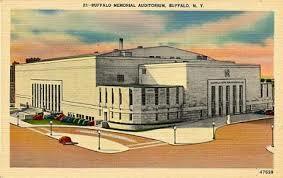 In 2007, the Aud was sold by the City of Buffalo to ECHDC. Salvageable items were removed to be sold, stored or removed. 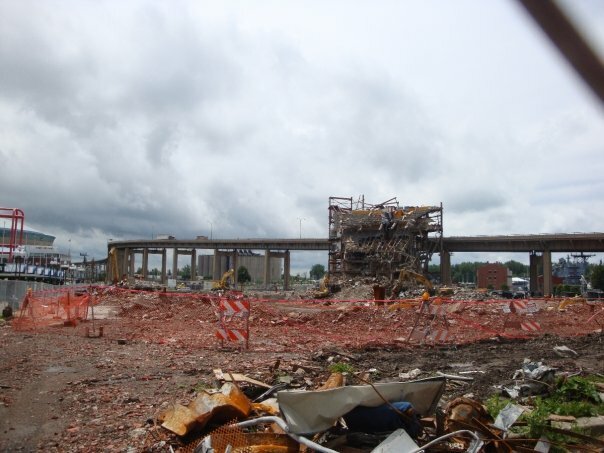 Asbestos removal and environmental remediation of the Aud site was performed in 2008 and demolition began in January 2009. A farewell ceremony was held June 30, 2009 to open the time capsule from 1939 and say goodbye to the Aud. The Aud Block is currently being redeveloped, which includes development parcels based on the historic street grid. One of the parcels will be developed by the Explore and More Children’s Museum. Additional restaurant and public spaces are anticipated to be developed as well. Water features on the Aud Block will be interpretations of the alignment of the Erie Canal, Main and Hamburg Canal, and the Commercial Slip. Across Main Street on the Donovan Block, south of the newly opened One Canalside, a portion of the canal water feature will be included, as well another development parcel. 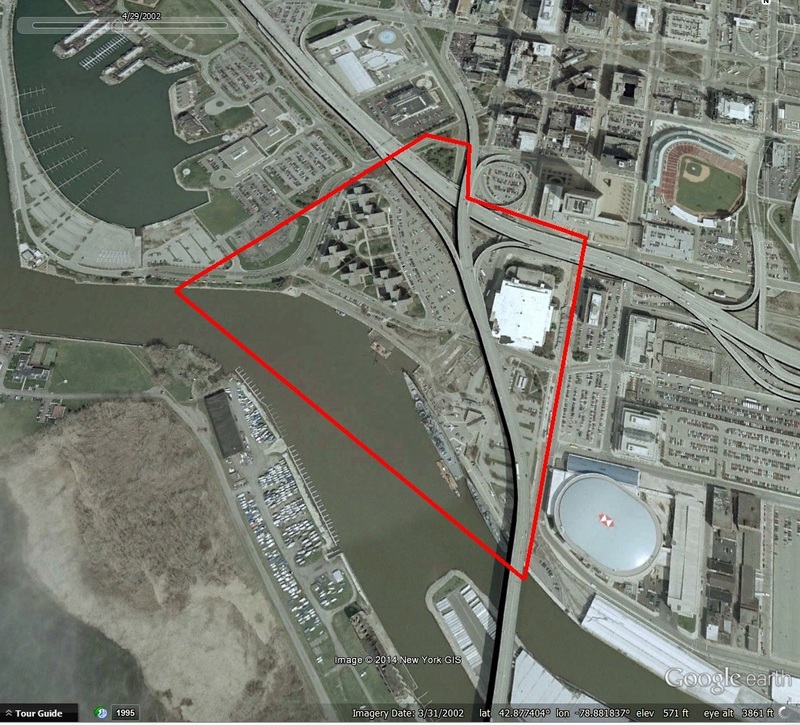 These projects, along with Harbor Center, will create the next phase of the Canal District’s development. Buffalo’s Canal District has been a unique part of Buffalo’s story since the founding of the City of Buffalo. The district has had several lives – from seedy underbelly, Little Italy’s crowded tenements, public housing, to sitting dormant and the recent redevelopment. 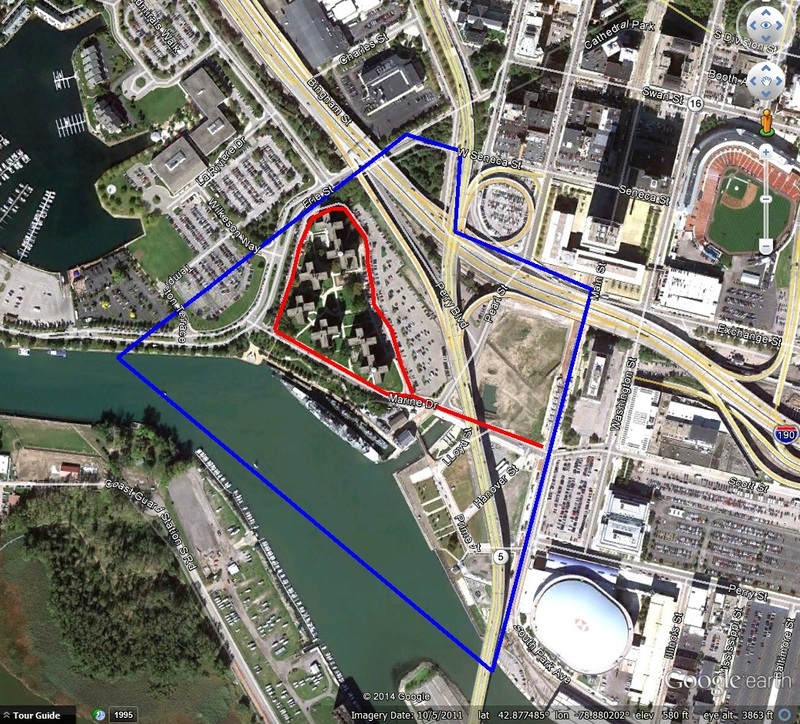 As Canalside continues to be developed, the story will continue to unfold. I can’t wait to see what comes next! Check out the Street Index to read about other streets. Syracuse, Buffalo Illustrate Broadened UR Concept. The Evening News. Newburgh, NY. August 9, 1961. First Tenants to Move into Dante Project. 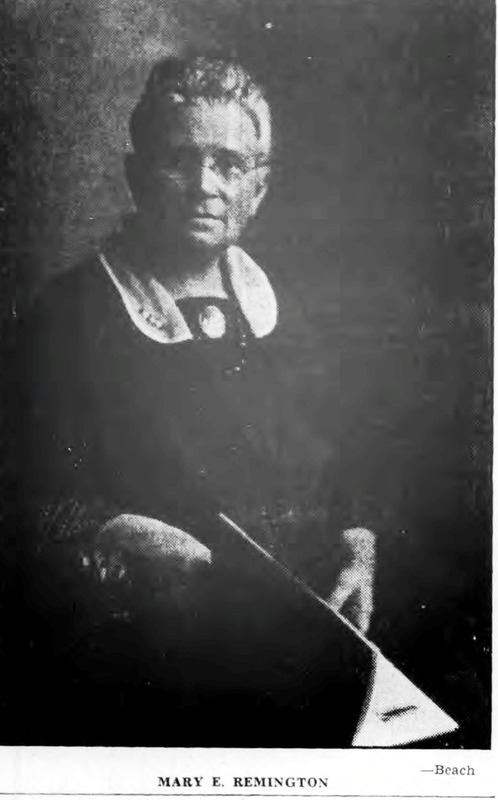 Buffalo Courier-Express. August 31, 1952. 8-A. Crowbars End Lurid History of Slum Area. Buffalo Courier Express. July 11, 1948. Move to Clear Buffalo Slum Area Launched. Buffalo Courier Express. October 2, 1936. p 7. Dante Tenants Fight Eviction. Baltimore Afro-American. August 30, 1960.